Which Service Providers Side With Users in IP Disputes? San Francisco - The Electronic Frontier Foundation (EFF) today released a new report and scorecard that shows what online service providers are doing to protect users from baseless copyright and trademark complaints. "Who Has Your Back: When Copyright and Trademark Bullies Threaten Free Speech" [PDF] examines how online service providers handle copyright and trademark-based takedown requests. The report expands upon EFF's influential "Who Has Your Back" annual report covering how online service providers protect users' data from government requests. "When a private citizen or corporation wants to silence speech on a major online platform, the quickest method is often a copyright or trademark complaint," EFF Director of Copyright Activism Parker Higgins said. "EFF has worked for many years to help people whose speech is unfairly targeted by these sorts of complaints, and we've seen how important it is that speech platforms have policies that help protect lawful users." 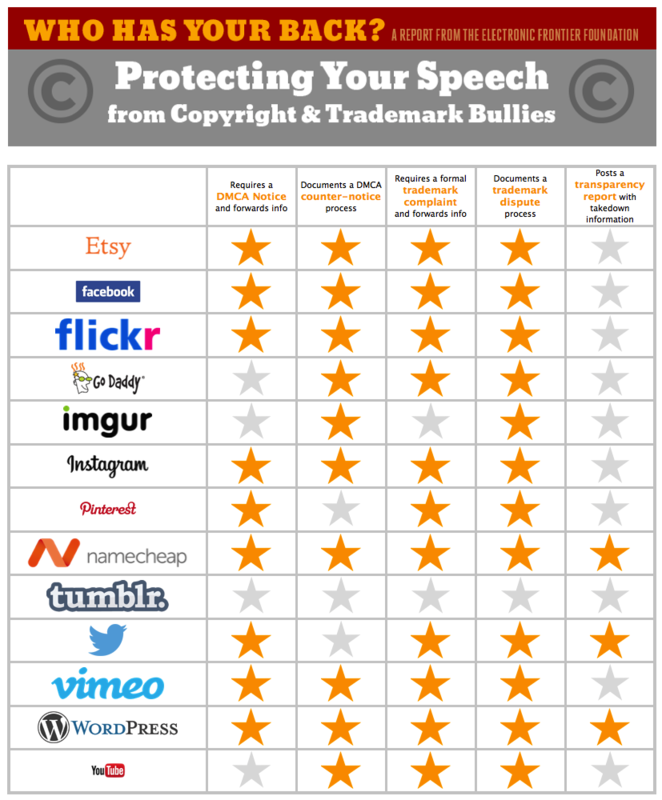 EFF examined 13 companies and issued stars if they met the baseline standards for what a service can do to defend its users' speech against copyright and trademark bullies. The services could receive a maximum of five stars, based on criteria including publicly documented procedures for responses to DMCA takedown notices and counter-notices, how the services handle trademark disputes, and if the company issued detailed transparency reports. Automattic's Wordpress.com and NameCheap were the only two companies to receive five out of five stars. However, two other companies were recognized for going the extra mile: Etsy, for providing educational guides, and Twitter, for publishing regular and thorough transparency reports. Overall, 10 companies did not publish adequate transparency reports, highlighting an information black hole for consumers. Additionally, four companies missed a star for their counter-notice practices—a critical procedure for restoring content that may have been taken down without cause. "Major online platforms are essential to online expression, so their policy decisions can have a huge impact on public discourse," EFF Intellectual Property Director Corynne McSherry said. "As users choose which platforms will host their updates, writing, images, and videos, they ought to know which of these services have publicly committed to treating their speech fairly and even helping them fight back against bullies that would try to take it down."